After Debbie-Rise was given the task to take Cocoice‘s black book and to mobilize the housemates to plan a coup d’etat and steal the crown. 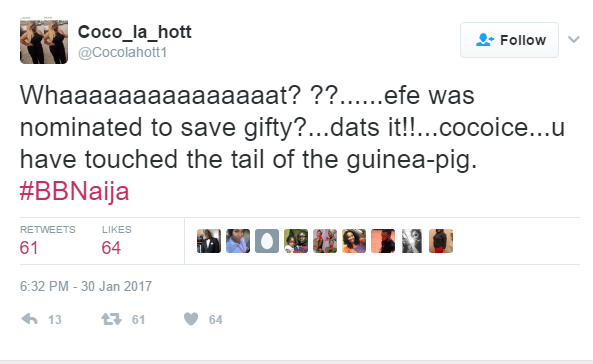 With the help of Thin Tall Tony, Bisola and Debbie-Rise, Efe was able to steal the crown.Efe was placed on eviction after Cocoice, the former head of house swapped Gifty for Efe. Below are some reactions from twitter after he was swapped. 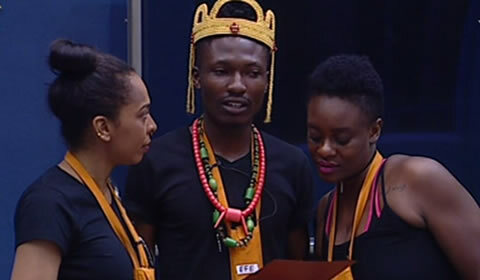 Efe, although crowned the Igwe of the house is still up for eviction.